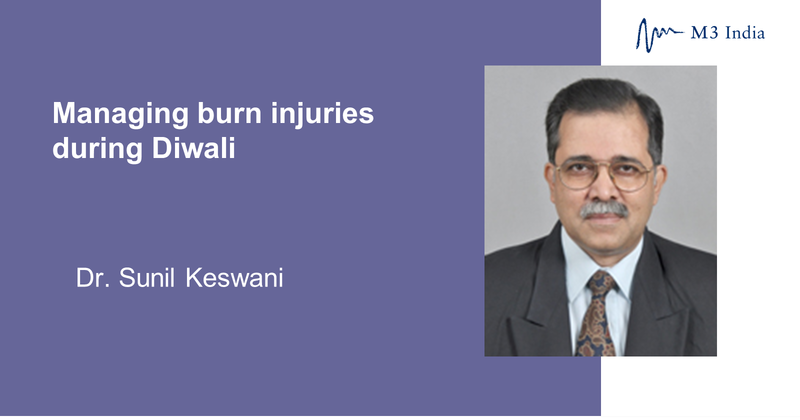 Dr. Sunil Keswani, an acclaimed Cosmetic Surgeon provides the treatment protocol and clinical management tips for treating burn injuries, commonly reported during Diwali. Diwali, a religious and cultural festival celebrated all over India as well as outside the country has people lighting earthen lamps and bursting firecrackers. But, there are also many burn injuries reported during this season, especially during the first 3 days of the festival. Research studies have shown that 70% burns in the age group of 10 to 15 is from firecrackers (64% are from flowerpots, 13% from bombs, and 9% from chakras). Flowerpots, bombs, and chakras are the main causative agents of firecracker burns in India. The hands, face, and eyes are more commonly affected body parts during such accidents. Careless lighting of crackers during Diwali or lighting crackers as part of a competition among children often leads to these mishaps. Lack of adult supervision, use of synthetic clothing and flammable flowing fabrics add to the problem. In flame burn wounds, subjective and objective evaluation is needed. Most of Diwali burns are minor- less than 10%. The wound site is assessed based on the anatomical part that is affected. Face, eyes and hand burns are more commonly reported during Diwali.